A quick visit to the doctors and out again clutching a handful of painkillers and a physio referral. I then spent all of yesterday flat on my back resting and plugged into an audiobook to stave off boredom. I managed to get through the rest of the Mogworld story and noticed that I need to paint the bedroom ceiling. And today my back feels a lot better! I’m off to see my physio tonight to get checked over but everything is looking good for more running! Week 7, Day 2: Can You Smell Chicken? Because of my fall – gracefully into the ditch full of water – on my long run on Sunday I’ve got a sore back today. I’m 99% positive I’ve only jarred it so I’ve got a trip to visit the doctor tomorrow but I don’t want to run while I’ve got shooting pains down my legs! I’m pretty positive a day flat on my back tomorrow will bring me back to 100% but I don’t want to run while it’s achy and cause something worse due to me overcorrecting somewhere else or jarring it even more so I’m going to postpone tonight’s run and start again later in the week. Besides … I’m sure a days rest will make me legs realise what they’re missing and I’ll be raring to go by Thursday! I’d been looking forward to this long run. I’d spent some time researching a good route and had decided on a part of Cycle Route 50 going from Walcote, heading towards Daventry and cutting onto the Grand Union Canal Path at about mile 16 … and conveniently finishing near a pub. Just by chance of course. It had rained heavily the night before and washed away all traces of the snow but the morning was bright and cool. The path was slightly wet underfoot but the sun was shining and I was looking forward to the chance of a nice, rural long run on a new route through the lanes with no distractions. I always pop to the loo before I head out for a long run so I wasn’t impressed when I needed a loo stop before I’d completed the first 2 miles. Typically, it was the usual English lane in Winter. Sparse hedges, flat fields and no convenient toilets. For miles. I ran on for another mile or so but unfortunately no pubs, public loos or moments of epiphany occurred so I carried on until I found a bushy hedge. Sigh. I don’t care what anyone says about blisters, black toenails, or chafing. The need to carry loo roll on long runs is the REAL curse of the long distance runner. Frequent loo breaks was unfortunately a recurring theme on this run. 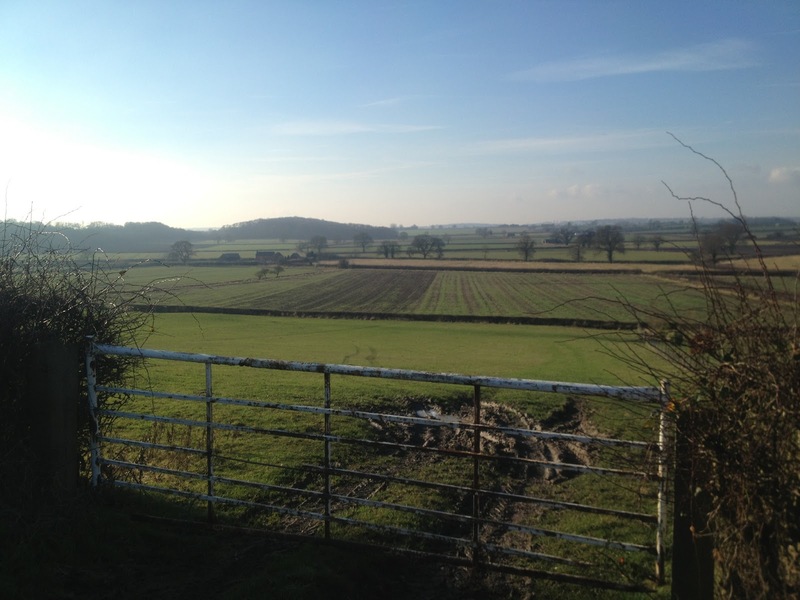 However, the countryside was gorgeous (if you were in front of me) and it was nice being out and about. 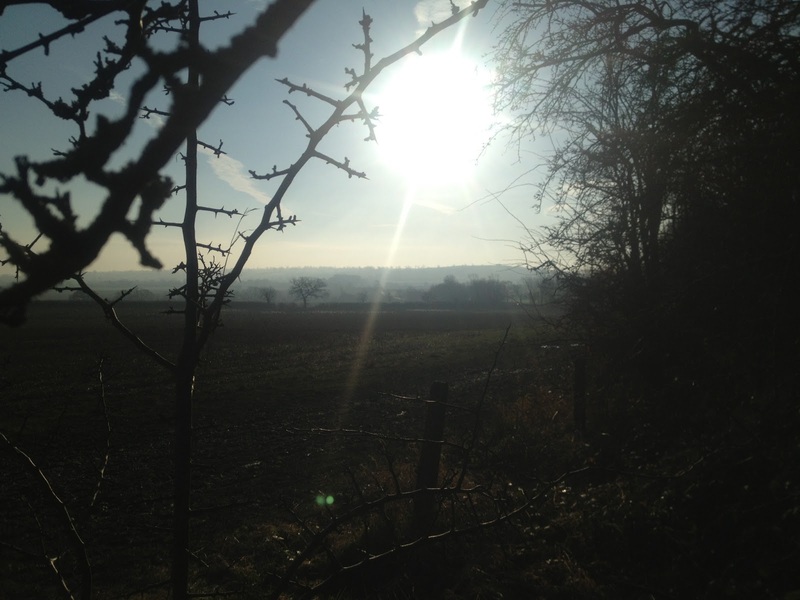 The sun was shining and it was – apart from the frequent loo breaks – nice to be running in the lanes and paths. I went through a few small pretty villages and past Stanford Hall. It looked stately and very beautiful set in a lovely estate … although I soon realised that the pool of water in front of it was actually flooding, rather than a picturesque lake, when I came around the next corner and found this. I stopped and just considered what to do. The water appeared to be about 4 – 5 inches deep and unfortunately was lapping at the wall at the left side so I couldn’t even cheat and run along the bank. As I stood there deciding what to do, it started washing towards me and the water speed increased and it started getting deeper. A river must have just burst its banks … Right. No time to stop and think about it. There were 2 choices. Forwards or back. Forwards. The water was deeper than I’d expected and while it only made it up to my knees, the running caused extra splashing which meant I was damp to the buff. In theory I could have waded through it I suppose, but if I was going to be up to my knees in dirty river water, I may as well enjoy the experience. 2 bemused cyclists had stopped to watch my progress and I think I disappointed them slightly as I’d made it through without any further mishap. The damper of the 2 cyclists admitted that he’d just hit a pothole further back and had been catapulted into the flood water and I think they were hoping for something amusing and running-related from me that they could watch safely from a patch of dry land. The rest of the village was pretty much underwater too, although in the hope of drying out a bit, I managed to clamber onto the banks to avoid a lot of the water. I carried on out of the village and onto a more rural section, rarely passing any houses or farms. It was very peaceful and isolated. There was a lot of water running along the sides of the roads and you could see the road shining and bright in the distance, snaking up the side of the hill. Running up the hill - which had looked a lot worse from a distance than it actually was - I spotted a horseshoe in the newly ploughed earth of the field on my right. I took it to mean that the rest of the run would be good. I could use some luck after the tummy issues and the floods. I reached the top of the hill and the road narrowed until it was almost just a track with fields stretching out on the right. The sunshine meant that I could see for miles and I could see the water shining in the fields. The road carried on down the other side of the hill and opened out for a nice long downhill lined by trees. The road turned around a corner into a dip … which was completely flooded. However, there was a bank on the right of the road and it was a good 6 inches to a foot above the water. It was squishy and slippery but I could climb up it and use it to get past the water. All I needed to do was run along it and jump the drainage ditches. Simple, right? This plan worked surprisingly well until I got to the last ditch, which was a good 2 metres away. There are a lot of good points to being an eternal optimist. However, thinking I can jump 2 metres from a standing start isn’t one of them. I missed the bank by at least 4 inches with my leading leg and splashed straight into the water which was surprisingly deep. My face must have had a comical expression of surprise as my momentum kept me going and I smacked into the ditch on the other side landing on my shoulder. Ouch. Great. I now had an upset tummy, a sore shoulder and hip and I was covered in mud. Plus my shoes which had dried out over the last 6 miles were now squelching again. Picked myself up and set off again. At least it wasn’t raining. Followed the lane for another few miles and the route was quite scenic. I passed over a few bridges and over the canal twice and the bright sunshine on the fields made everything very pretty. I could almost forget I was covered in mud with wet feet and had run out of loo roll. I finally got to the end of the lane and it finished at a busy main road. Odd. Also, there was a definite absence of the cycle route signs I’d been following. Had a quick check on the GPS … I had somehow wandered about 3 miles off route. There must have been a sign I’d missed. (Sigh) I didn’t fancy retracing my steps back 3 miles, so I set off along the main road towards the next village and I could pick up the cycle route from there. Ran up the main route hopping onto the bank whenever a car came. After what felt like a never ending hill – but with no floods! - I finally came into sight of the village. There were absolutely no Cycle Route signs to be seen, so using the GPS to stay on track I picked it up again and made it back onto the right path. Thankfully, the last few miles passed without any further loo stops, falls, mud, floods or getting lost. I had been wondering when the wild dogs would attack or a tree would fall into the road blocking my path but luckily it looked as though I’d used up my bad luck for this run. Lucky really. I’d also used up my water, gels and loo roll. It’s a build-up run so at least it will be more interesting than running the whole session at one speed, but 7 miles on a treadmill. Sigh. Total: 6.7 miles including warm up/ cool down. As the snow still seems to be sticking around, I put my Yak Trax back on for this run and headed out to do the miles around the town. Just like my previous snow runs, I didn’t try to stick to the pace guidelines as I wanted to focus on safety. It would be gutting miss the Paris Marathon because of a broken leg ...! The deep snow is still around, so I’m afraid that this is another treadmill session … yes – cheating AGAIN! If it makes it seem less cheat-y, the treadmill wouldn’t slow down properly as the touch screen wouldn’t work with sweaty fingers (nice, right?) so I did end up doing slightly longer intervals than intended all the while stabbing at the screen with a perspiring digit and swearing (in a muffled way so I didn’t get banned from the gym) while my legs span wildly trying to keep up with the treadmill belt. Yes, I really did look as silly as it sounds. I’m missing 1km as I ran out of time on my lunch hour, so I’ll add this onto my longer run tomorrow to keep things neat and tidy! Goal: 16 miles at 8:30 – 9 min/mile pace. Amended to 2 hour run due to heavy snow. Actual: 16.17 miles at 9:50 min/mile pace (2 hrs 38 mins).. This run was supposed to be a long Sunday run of 16 miles at 8:30 – 9 min/mile but because of the heavy snow Steve Marathon Coach agreed I could change the session to a 2 hours snow run instead. It wasn’t terribly cold, but I decided on a warm base layer and compression tights with normal tights over the top and my pink jacket. Plus a buff and a big hairband doubling as a hat. This doesn’t sound much but for me who prefers to run in a vest and capris it’s a lot. Plus I decided to go with my ancient 2160s with Yak Trax. These trainers have done plenty of miles (read: far too many) so if they got soaked and shrank to a size only a child could wear, it wouldn’t be a huge disaster. I decided to stay off road as much as possible so started with a short distance on the canal path and into a shortcut running alongside a reservoir. It all looked picture perfect and the snow covered up the graffiti so it looked unexpectedly picturesque. You can no longer see that ‘Brownsover Gang 4Ever’ consider the wall on the left to be their private getting-drunk-on cider-spot. Managed to sneak through the snowball fight without taking a snowball to the head. Either they were all terrible shots or they were too engaged in snow gang wars. 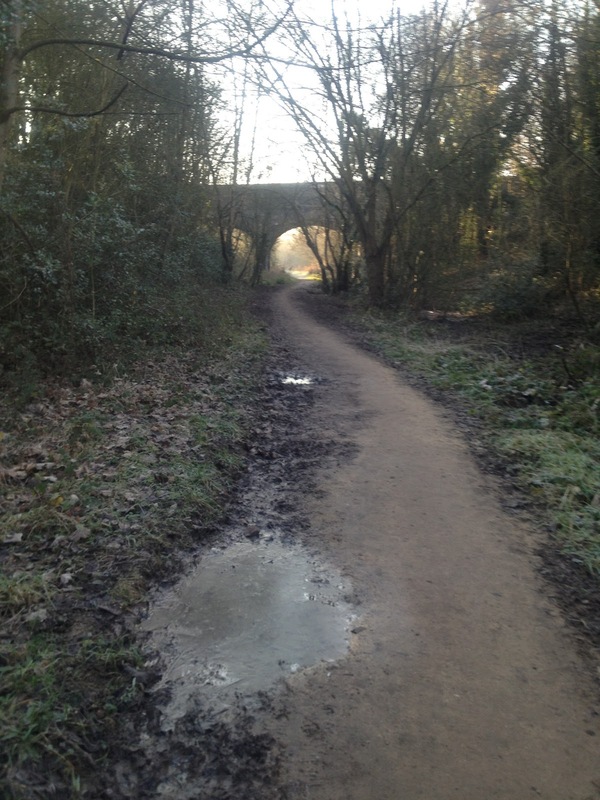 I ran onto the disused railway line cutting through the centre of Rugby. It sounds dreadful, but this is one of my favourite places to run. The trail goes through the middle of the town, but it’s always very peaceful and scenic. The snow was very deep here. It had been walked on and compressed on the pavements, but it was deep and beautiful here. I passed another runner who had dressed for the weather by wearing a hat, thick jacket and minuscule shorts. And had blue legs. He waved madly when he saw me and said "Another crazy runner!" He had mad eyes and a happy, happy grin! I probably looked exactly the same. Except for the hotpants and blue legs of course. The trail finished and I carried on down the small, quiet lane. Strangely, there were a lot of tyre tracks marking the white on the ground despite the deep snow and the continuing heavy drifts … and I could hear shrieks and loud voices. The view opened up and I realised that I had found THE sledging ground in Rugby. There must have been 50 people, adults and children sliding down the hillside on brightly coloured sledges, rubber rings and things that looked like (but surely couldn’t be? Well this IS Rugby …) bedpans. I passed by the sledging hill and soon the tyre tracks were fading. I realised that the only marks on the snow were my own footprints and they were quickly filling up with snow too. It was a good day to run. How often do I get to run in snow? Also there were no pace guidelines, no limits. I had 2 hours to run, explore and make my own footprints in the snow. I spotted a hill in the distance, gleaming white against the grey sky. I’d had my eye on this hill for a couple of months. I’d always meant to run up it but had always been stopped because the track leading up to it has always been too deep in mud. Mud wasn't a problem today. 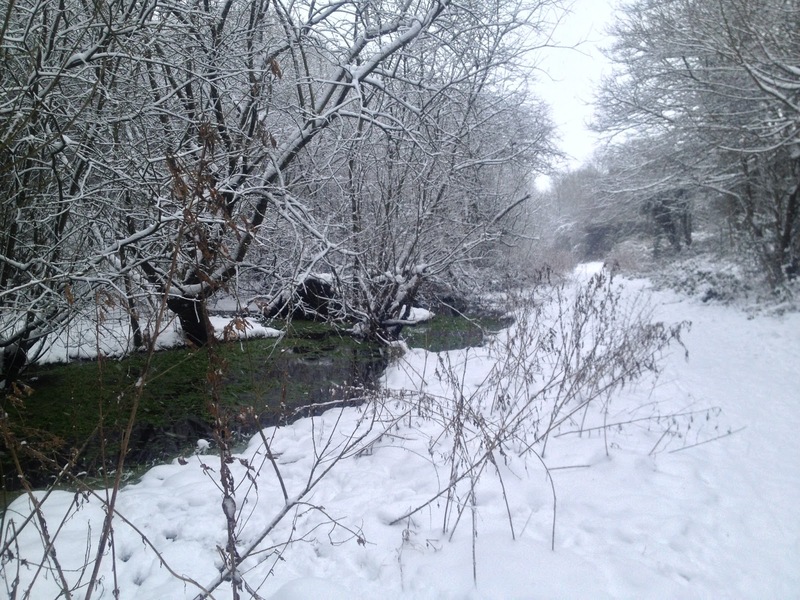 I started up the track optimistically… but soon the snow was too deep for running … then too deep for jogging … then too deep for walking ... so I waded. The bloody mindedness that drives boyfriend, family and friends mad, kicked in and I waded up to the top where I triumphantly stood in my knee deep snow and wrote my initials. SF. Sarah 1, hill 0. Waded back down again and got on with some running. A car passed very occasionally and whenever I heard one approaching I hopped up onto the verge. Better a slow run than a flat runner. Most of the cars were fantastic and gave me plenty of room if there wasn't a bank to hop onto but a few weren't as courteous. I didn't mind the shoddy driving but hoped they realised I wouldn't be helping push their car out of the hedge when their crap driving span them across the road and into the ditch. Crossed onto the Oxford canal path to pick up the road I was on earlier. The snow was deeper and less packed here and it was harder to run. But at least I wouldn’t be able to get confused by the snow and take the wrong turning. I ran along the path for about a mile and picked up the lane again. 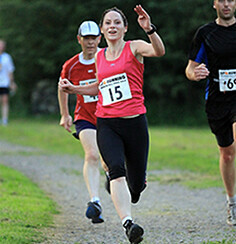 There's an acceptable level of looking strange when you're running. Wearing lycra is acceptable. Going for a run dressed head to toe in neon pink and other eye-burning colours - acceptable. But today I wished for a new level of acceptable … Swimming goggles. It was a gorgeous day to run, but it had been snowing non-stop since I started running and the snow blowing into my eyes had really started to become quite painful. I tried pulling my buff up over my eyes, but visibility was so limited it wasn’t a viable option. Snow might be painful but running into trees was probably even more so. Back on the lane and any sign of my earlier footprints had completely disappeared and the road was flat plain white again. 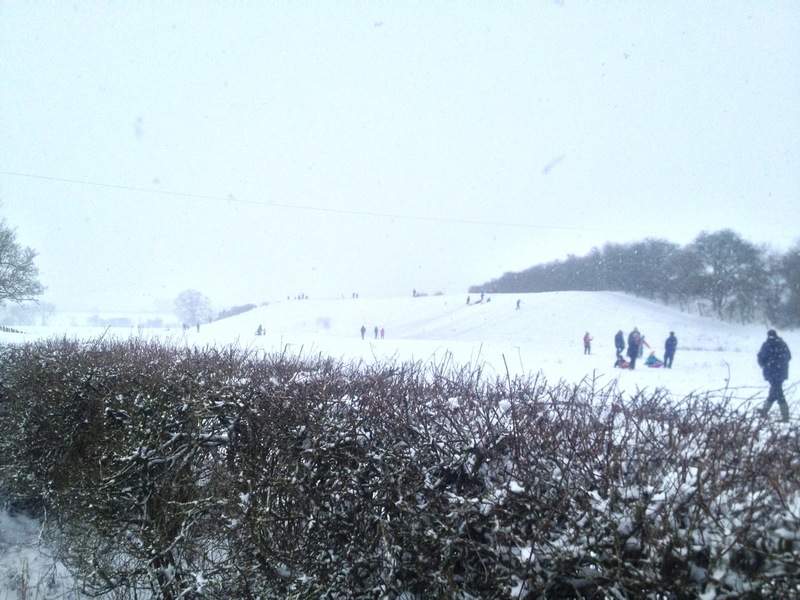 Past the sledging hill again … now almost deserted. I cut onto the footpath and the footprints had vanished. 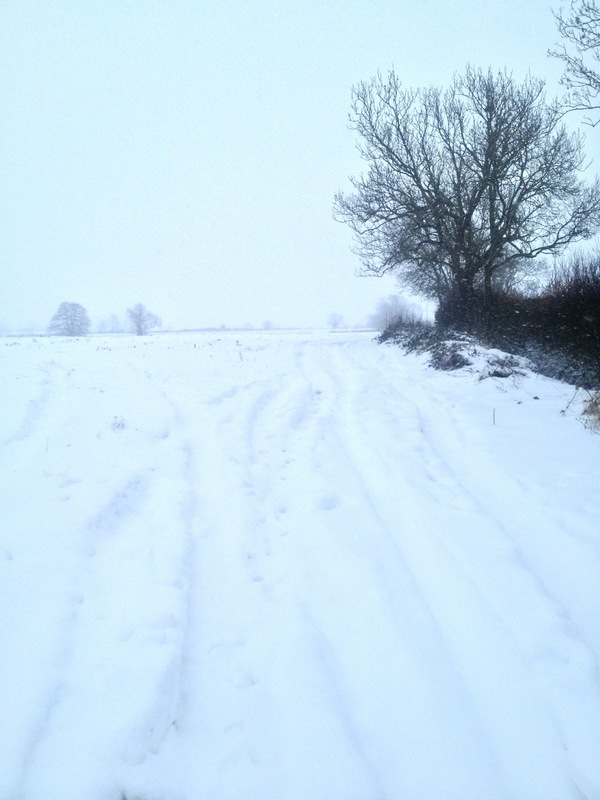 Only the hard packed snow of the footpath suggested that it had been trodden by many feet earlier. It was quite surreal. Everything was white and blank. Was accompanied part of the route by a loopy Springer Spaniel who was thoroughly over-excited by the chance to run in the snow although ‘thoroughly over-excited’ is a standard emotion for most Springers. How can anyone not like dogs who love running THAT much?! Running down the last part of the hill, a few people were pushing a madly wheel-spinning truck back onto the road. The chap wound down the window and shouted at me "You're completely mad!" I shouted back "…But it's fun!" Got a grin and a thumbs up in return. He was followed shortly after by a MX5 with its 4-ways flashing wildly slewing from side to side in an attempt to make it up the hill with a Springer Spaniel cheerfully looking out of the passenger window enjoying the ride. Another brief run on the Oxford Canal path, passing barges with yellow lights shining brightly against the darkness and snow. Having half a mile to make up, I did a lap of a housing estate and passed a man with either too much time on his hands or a miserable home life … shovelling snow off of his drive. In a snow storm. I decided to do this session on the treadmill as it would be difficult to maintain speed or to do anything other than what was safe in the snow this evening. The slushy snow that was slightly melting has now frozen over and I thought it might be a bit treacherous in the dark so I cheated and turned to the trusty … if more boring, treadmill. Absolutely nothing of note happened, apart from a brief loo break at about kilometre 4 ... but I know you don't require any information about *that* ... so I'll adjourn. Actual: 7 miles at an average of 10.07 min/mile … unable to speed up to HM pace on the middle 3 miles due to deep snow. I knew that this session was going to be slightly different than the one scheduled due to the amount of snow that came down today. It was a beautiful day, but not one designed for moving at speed. I decided that I’d aim to go out and get the miles in. Even if the paths were too treacherous to change paces at least the whole run would be at a higher intensity than usual due to the ankle deep snow. The light of the snow meant that tonight I could reclaim one of my favourite routes which is usually lost to me in winter due to its darkness and loneliness. 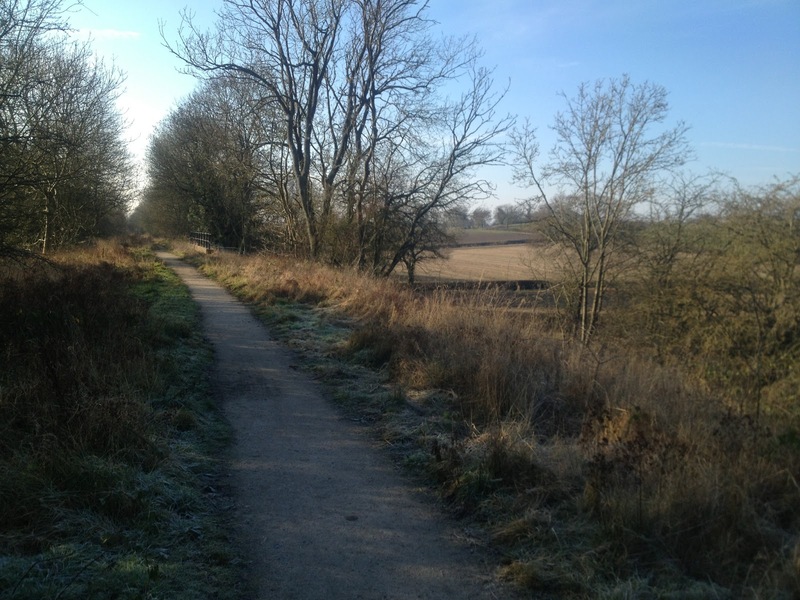 It's beautiful and crosses muddy trails, gravel paths, several bridges, fields, lanes pavements and canal paths all in 3 miles. I would add on a 4 mile route through a housing estate but the first 3 miles would be a treat. It was a GOOD run. Not good in terms of pace, nor in terms of fitting into my training schedule but just a run on one of those days that it is good to be a runner and to be able to run on. It was a sensory run. No audiobook tonight. 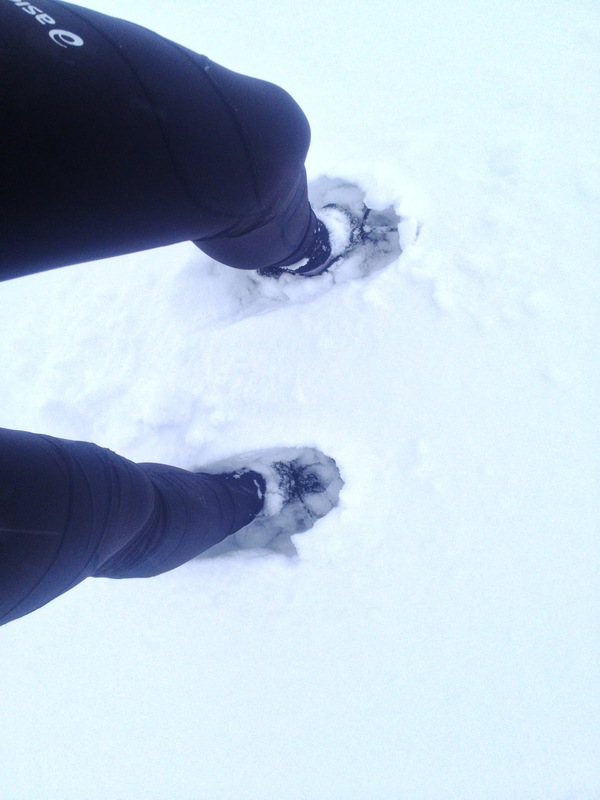 I was listening to the crunch and creak of snow under my shoes – who knew that snow creaks when you run on it? Smelling the grey, dusty smell of wood smoke and seeing the yellow light from the barges on the canal. Feeling the cold brush of the snow on my skin. I ran on and into the housing estate and there was a fox in the road. He stopped and looked at me as though considering whether I was worth running from. A bark from a dog up the road made up his mind and he flowed smoothly across the road and into the hedge. The snow was loose and powdery and there was almost no ice at all. My calves were burning from the extra work as it was like running on dry sand. With every step, the ground shifted and moved and I left a trail of deep footprints behind me. Car drivers crawling their vehicles up the road craned their necks as I passed as if they couldn't believe someone was running today. I ran on. Goal: 8 miles steady 8:30 – 9 min/mile. Actual : 9 miles at 8:50 min/mile. I’d had a double session today as I’d had to complete intervals from the session yesterday at lunchtime. 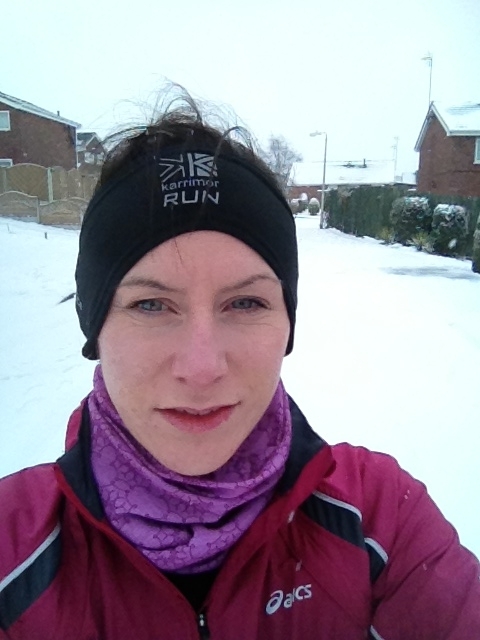 It was very cold – it took me about 5.5 miles to warm up despite thermals and wearing 4 layers! Lots of ice and snow made the roads and paths treacherous. I didn’t look at the pace on the Garmin as I didn’t want to feel I had to up the pace in these conditions. I ran to what felt comfortable ... and safe! It was beautiful! There was hoar frost all over the trees and the snow made satisfying crunching noises as I ran over it. My pace was in the right range!! 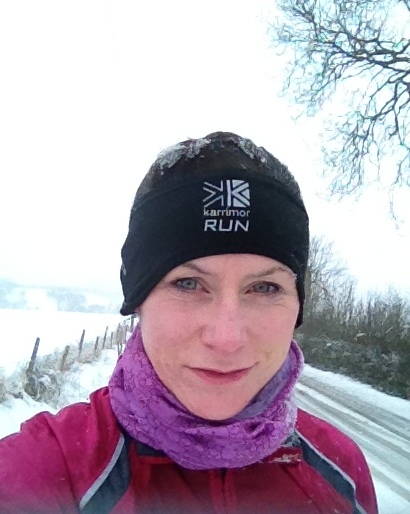 See – all I need is a bit of snow and my pacing sorts itself out! It was destined to be One Of Those Nights. It was a 7 mile run scheduled for today which meant that I couldn’t quite fit it into my lunch hour AND have a shower … so it was postponed until after work. I had an hour window between getting home from work and my partner having to go off to his group, to run and I was looking to get the training session in then. However, due to a combination of icy roads and customers wanting to get their money’s worth from his time, he didn’t get home until 6.30pm which meant my run would now have to be either on the treadmill or when he got home again which could be any time from about 10pm onwards. The treadmill was sounding a more sensible option, especially with all the ice on the pavements and I could get the run done nice and early. About 10pm I woke with a snort in my three year olds bedroom, holding a now cold bottle of milk and a sleeping child. Ok … a LATE run tonight then. 7 miles on a treadmill sounded DIRE so I decided that I would test out the new trail shoes on the ice and snow on a 2 mile warm up and then do the speedy intervals on the treadmill. Technically cheating but I wasn’t entirely sure it was possible to manage a sub-8 minute mile on the ice without doing a Roadrunner style wheelspin and landing in an undignified heap on my bottom. Amusing for any passers by but not entirely conducive to successful training, completing a speed session OR staying uninjured. My partner arrived home at 10.30pm and I was ready to head out, resplendent in a hi-viz jacket, warm hairband, gloves, pink jacket and new trail shoes. In fact I looked like a Christmas tree that had collided with a traffic cone. I spent the first mile of the run looking around like a meerkat and making eep noises – getting ready to scream should a weirdo carrying a clipboard – why a clipboard?? – should leap out from the neighbour’s conifer hedge and make molesting motions. Quite what these should be I wasn’t quite sure but I thought I’d probably know them when I saw them. I did of course have my personal alarm (which I carry as standard – free from the local police station) but I’d spooked myself and did just 2 miles and got home. Went and got treadmill ready for speed session and realised phone completely dead. I couldn’t face the thought of an hour’s run on the treadmill with no distractions so went indoors to charge it ... next thing I knew it was 5 past midnight ... sigh. Picture the scene: Next morning at work, paper being flung up into the air and hand searching desperately through a desk before a single sheet of paper is brandished triumphantly in the air ...a free 7 day gym pass to a local gym. Intervals finally completed indoors in the warm gym, looking out of the window at the ice and snow outside. Goal: 5 x 1000m in 4 – 4.15 (6:26 – 6:50 min/mile) starting every 6 minutes. 1 mile warm up at 11.5 kmph (9 min/mile) and approx 250m recoveries while waiting for the next 1000m interval. I was looking forward to this run as I was going to get to do it in daylight. If I was really lucky I might see some trees, a hedge or even (gasp!) a rabbit. All I normally see on my runs are car headlights, black pavements and orange sodium lights. 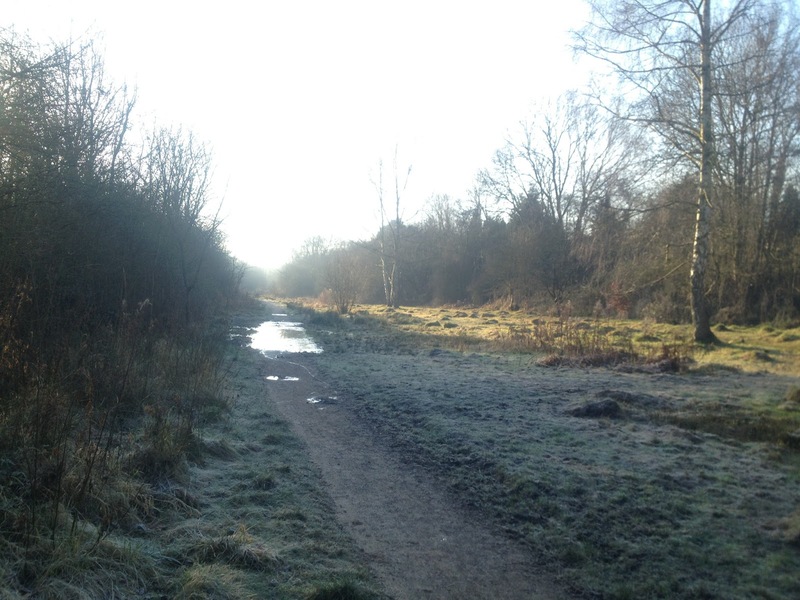 It was a fresh morning – read: flipping freezing – and the grass was stiff and crunchy under my trainers. I’d already had the debate with myself – no gloves; sore, cold, blue hands for first 2 miles or gloves; warm hands for first 2 miles and then hot hands and nowhere to put gloves. I’d had the brilliant idea of regressing back to primary school and tying mittens onto bits of string and threading them through my jacket sleeves, but lacking any string or the time to get creative, I decided on gloves and hot hands. I’d had to stop briefly after the first mile when I realised I’d forgotten to programme the Garmin for an average speed so I did that as quickly as possible and then set off again with the correct settings. 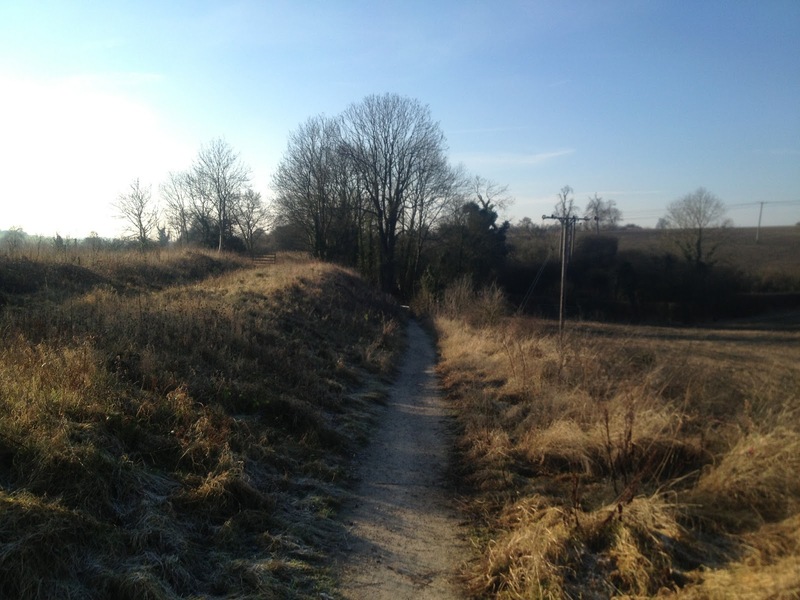 I’d decided I was going to try and get the pacing a bit closer to the 8:30 than last time so I wanted to make sure I had it all set up ok.
After the 1st mile, the route takes me onto a disused railway line, which this morning was gorgeous! 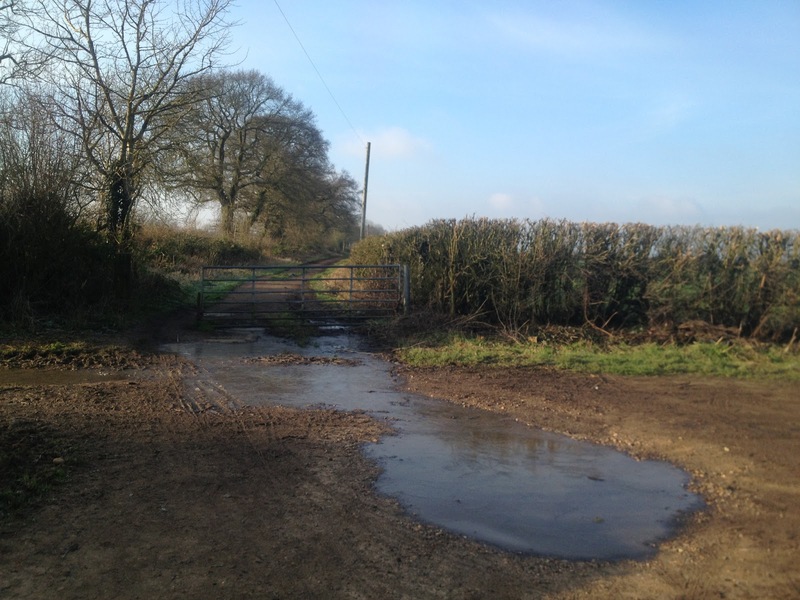 The puddles were all lined with ice and the grass on the verges was frosty and still. There was a bit of mist lingering and everything felt very quiet and peaceful. There were a few dog walkers about, but it felt as though I had the whole path to myself! 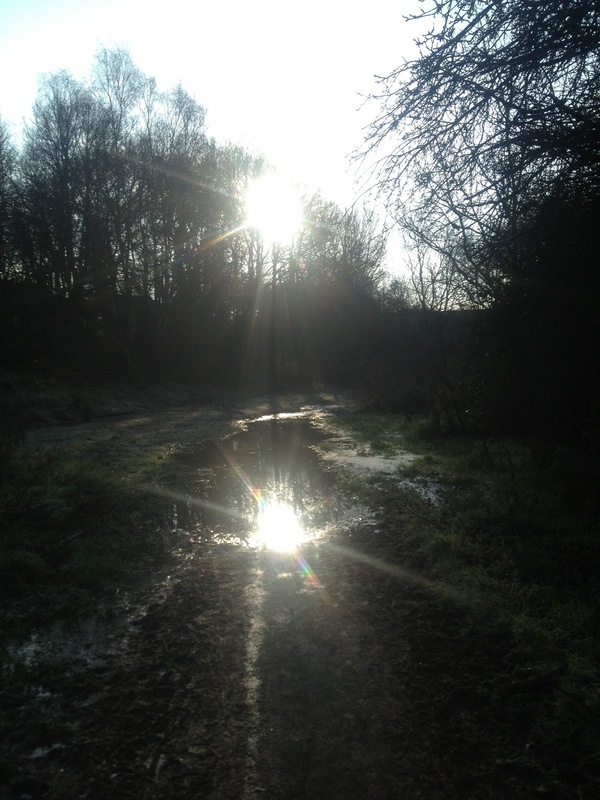 There were a few boggy moments on the path. 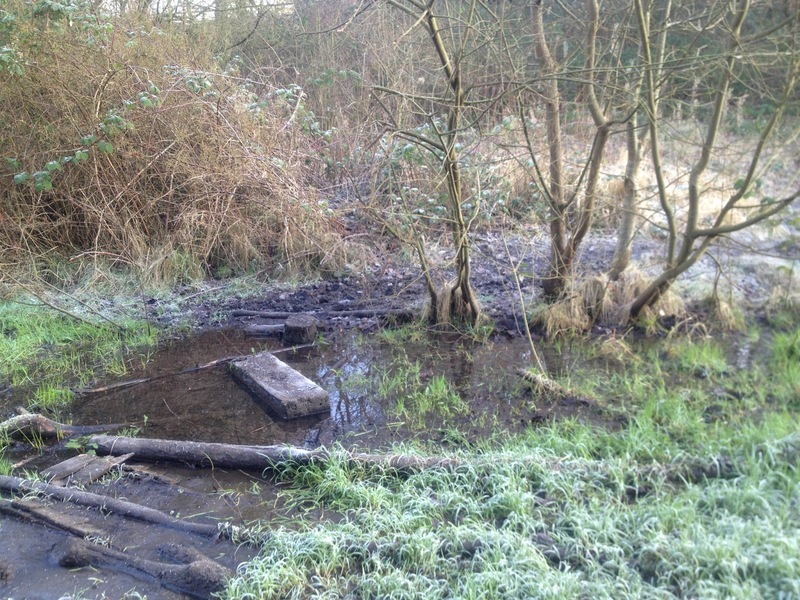 Unfortunately, the puddles were icy enough to be slippery to a carelessly placed foot, but not frozen enough to take my weight as I found out when I tried to dash over a wet section. Cue one wet foot. I crossed a road, then I was back onto footpaths and heading around the edge of Draycote Water. My end destination was a pub on the canal which should be about 13 miles from my starting point (Anyone would think I PLANNED these things …) so I had about a mile to add in somewhere. 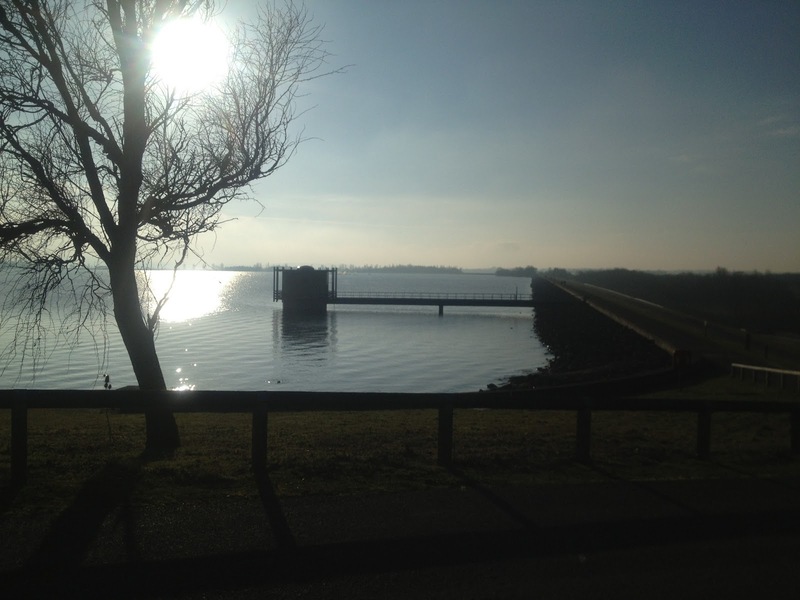 I added the extra distance in along the edge of Draycote Water as it was flat and scenic. There were lots and lots of runners going around Draycote Water today. All wearing the same expressions of determination and stubbornness – giving up their Sunday morning lie-ins for the chance to pant around the edge of a reservoir. In fact, there were so many I would have thought it was a race if they were not all going different directions. After Draycote Water, I headed back out onto Cycle Path 41 which took me along the Blue Lias line which is another disused railway line. It’s flat and fairly straight and the footpath is smooth and gravelled. There are lovely views and it’s pretty and nice to run on. I had about 2.5 miles to run on this and I always enjoy this part of the route. I’d forgotten to bring any water with me today – usually on runs over 12 miles I carry a standard 0.5l spring water bottle then I can bin it if it gets irritating, but today although I’d set the bottle out ready, it was sitting on the side in the kitchen about 12 miles away. I thought I might struggle without having a drink but I didn’t and in fact didn’t feel particularly thirsty. I listen to audiobooks on long runs if they’re off road sometimes and if it’s a good one sometimes when I run the route again, it’ll remind me of the book. This part of the route reminded me of Whispers Underground which I’d been listening to last autumn when I was just over halfway through a 22 mile run in preparation for Liverpool Marathon. I miscalculated the distance and unfortunately was still about 2 miles from the pub when I hit the 14 mile point … a rookie error. But it will give me inspiration for a 16 mile run which I’m sure will come up at some point. Week 4, Day 6: 5 miles of fartleks ... with a mid-run loo break! Got home and thought “Why is it that fartleks are always slower than normal runs on average pace but always feel much harder?” I’d forgotten that I’d added another mile onto my normal 4 mile route and was working out the pace based on a 4 mile run … yup. No hope. But fartlek runs always DO feel much harder. I’d taken Steve Marathon Coach’s advice on this one and instead of changing speeds based on the terrain, I’d changed the paces based on time. It had meant that I was less tempted to speed up on the downhills and slow down on the uphills because it was a fartlek and I was “allowed to” slow down. I hadn’t stuck to a set pattern but had changed paces on the minutes and half minutes. Was this the impossible session? It was a session I’d been dreading. I’d psyched myself up for it on Tuesday … and then the track was closed so the dread had been growing bigger and bigger in my mind throughout the week. A 6 – 6.22 min/mile pace sounded very quick and it was speed I’d never attempted before. And a speed I didn’t think I could achieve without falling off a cliff. In the absence of survivable, exactly 400m cliffs, I went along to my local track to get going. I did a 1.8 mile loop around town to warm up. It was a cold, dark evening and as I ran I talked myself into the session. “It’s between 6 and 6.22 minute mile. If I aim for the slower end then it’s only .25 seconds a mile slower than my entire 5k on Saturday.” My brain would occasionally interrupt with things like “It was a new PB … what if it was a fluke?” or “What if your legs just don’t GO that speed?” I ignored my brain. Either I could or I couldn’t. I would TRY. And if I ended up throwing up on the track or fainting or something equally embarrassing I’m sure someone would do something. Throw a trainer or hand me a mop. Or something. Deep breath. The track was very busy tonight so there might be a fair amount of dodging involved as there were a lot of sessions going on. I chose a far corner of the track as my starting line and went. I’d decided not to use any complicated settings on the Garmin but just to keep it running and press lap at the start and end of every lap and use the timer as the reminder to go. My brain stops working when I run and I thought there was less chance of ‘Porridge Brain’ confusing things if the settings were simple. It did mean that the Garmin didn’t give me an accurate pace reading until I was almost 150 metres around the track but once I’d done the first few laps I had more of an idea of the pace I was aiming for. The pace was fine. And just as importantly the distances were small so as soon as my brain twigged the speed I was running, it was time to stop. There were 3 laps just over the pace specified by Marathon Coach Steve, but most of the laps were fairly evenly paced which I was very pleased with considering it wasn’t a pace I’d tried before. Best of all, I completed the session … at the right pace … and I didn’t throw up, faint OR have to fall off a cliff to do it. Win.